Will The New Bishop of Galloway “Embrace Change”? Fr McFadden is a former Rector of Scotus Seminary, which closed on his “liberal” watch. He has featured prominently in our newsletter over the years, and there is no question about his agenda. So, it’s not surprising that his welcome to his new bishop is far from being unqualified. If the Bishop pursues Fr McFadden’s agenda, and “embraces change” he’ll be welcome in Galloway. That’s how I read it. Interesting times ahead in that neck of the woods. Let’s hope and pray that the new Bishop is not of the same “liberal” mindset as his Vicar-General. That, frankly, would be the nail in the coffin of the Diocese of Galloway which has been in meltdown for years. 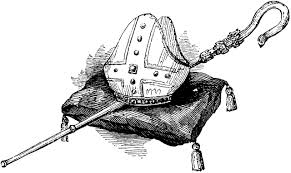 It goes without saying that we wish the new Bishop every grace and blessing in his appointment to a diocese which a Galloway priest once told me was/is the most sterile spiritual soil in Scotland, second only to the Diocese of Aberdeen for it’s impoverished Catholicity. I don’t know a thing about the new bishop elect of Galloway, but I wish him all the necessary divine graces to assist him in so grave a charge. I also took Fr. McFadden’s “in the process of embracing change” to be a hint to the new bishop that he will be expected to fall into line with a pre-agreed agenda for the diocese of Galloway, which, as a result of earlier change embracing, is now less Galloway than gone away, just like those five seminaries Scotland once had! He served under +Maurice Taylor as a curate in East Kilbride – a chip off the old block? Galloway could hardly sink any further and I speak from personal experience. I’ve heard horror stories about Galloway, too. It really is a bleak diocese. Are you OK with Fr Willie McFadden being Vicar General in Galloway, after the reports about his dissent in the CT newsletter? I wonder if any diocese has a chance to improve when dissenter priests are given important jobs. That’s just my laywoman’s view. He is also the priest sent in to Fr Despard’s parish during Fr Despard’s suspension and trial. I’m not sure that that’s a good sign. Well, believe it or not but I once shared a taxi with the Bishop – elect in Rome. A taxi ride from the Via Cassia to Ciampino Airport is not long enough to come to any conclusion and it was around fourteen years ago. However, I know that Father Nolan doesn’t exactly set the heather on fire. I don’t think we’ve got another Athanasius Scheinder on our hands! So you shared a taxi with the new bishop and in Rome of all places – if only you could have known that he would be a bishop one day! I agree that we are unlikely to see another Athanasius Schneider in the person of bishop Nolan. If he was that Traditional he would never have been appointed. I,too,know nothing about this new bishop. However, I am not holding my breath about his orthodoxy judging by his confreres but maybe that’s not fair and we should wait and see. I’ve actually heard that he is quite orthodox, and that his parish is not as bad re. liturgical abuses at Mass as other parishes. There’s also a very good assistant priest there, who is very orthodox. So maybe we should give him a chance, as you say, wait and see. Other than that taxi drive and a few stories which may or may not be true, I know very little about this priest. There’s a few encouraging words above but boy does he have his work cut out for him in the Diocese of Galloway! First of all, I LOVE the new website! It’s beautiful and those quotes on the homepage are fabulous. I’m afraid I don’t know anything about the new bishop either but wish him well. However, I can’t help agreeing that if he was a really traditional minded priest he wouldn’t have stood a chance of becoming a bishop. On the other hand, there’s the comments about his parish not having as much liturgical abuse. I would be interested in more details – would it be too much to hope for that he doesn’t allow Communion in the hand? Again, would he have been made a bishop if he took that position? I do wish him well and have him included in my prayers. I also love the new look website. Such a rich colour! I loved the old one as well, the cheerful red, but this one is a bit more rich and very streamlined. Congrats to Catholic Truth for a great website as well as a great blog! I bet I’m now officially a crawler as well – LOL! As for the new bishop, I don’t know anything about him either but I agree that if he had shown himself to be traditional leaning he wouldn’t be where he is today. I will remember him in my prayers, of course, but I doubt if he will be able to stand up to the ultra-liberals in the bishops’ conference not to say priests like Fr McFadden in his new diocese. God help him in his ministry as a bishop. I’m also impressed with the new look website. The CT website is easily the most professional and modern of all the Catholic websites I’ve ever seen. This latest one is continuing the high standards. Congratulations to webmaster. I think everyone needs to give the diocese of Galoway a break. They have had a tough time and the people there do their best. We all speak as people that travel about 10 feet and find another church theres areas down there that travel almost 2 hours before they leave their parish boundary and rather than scorning that shouldnt we applaud their steadfastness? maybe they get by using the serenity prayer? This is not very christian to sit on here spouting vitriol of a place that you dont know much about which is clear from the way you speak of it! I said in my post above that we should give the new bishop a chance, wait and see. I don’t think anyone is “scorning” Catholics in Galloway and there’s no “vitriol” but there is a lot of concern in the diocese about the state of the Church there as I know from friends who have lived there. I should have said I had a friend (and her family) who lived there as she is now deceased. I don’t really have any contact with the family any more, so my information about the diocese is not bang up to date. I didn’t mean to mislead you. I’ve posted some comments on another bishop (Bishop Williamson) on the General Discussion thread for anyone who may be interested. Opposite extreme to the liberal bishops; same rebellious spirit and end result! Thanks to all who have emailed me, and commented here to rightly praise our webmaster’s handiwork in the form of our new website. Your encouragement is much appreciated and valued, praise being the sign of a generous soul. God bless you all, and if I’ve not yet replied to your email, I will do later today. I’ve got a bit of a backlog, but hope to catch up this afternoon. The shorter your message, the more chance of a speedy reply! Thanks for your comments in defence of Galloway but, be assured, there is no vitriol on this blog in respect of that (?your?) diocese, but, far from not knowing anything about the place, and speaking for myself – I spent time in Galloway in my youth and I’ve spoken to both laity and clergy from the area over the years since I graced the place with my own saintly presence, and all agree that it’s about as far removed from being what a Catholic diocese should be as the Orange Order. Of course, if you’ve read Kevin McKenna’s ludicrous SCO column this week, you’d think about joining the Orange Order before you’d join the Legion of Mary, but for real Catholics, clued into the state of the Church, the Diocese of Galloway was in meltdown under Bishop Maurice Taylor and, with the appointment of the failed Seminary Rector, Fr William McFadden as Vicar General, things have not improved – cf the “Embracing Change” project. For your interest, we were reliably informed some years ago that, but for the detailed Catholic Truth reports on him, quoting his own words to the clergy of the Archdiocese of Glasgow, among other words (!) Fr McFadden would, more likely than not, have been wearing the Galloway mitre by now. We did remind the Vatican of those reports in the not so far distant past, both by letter and via the Newsletter, so maybe somebody among the “high heid yins” is paying SOME attention, after all, and, hopefully, Galloway will stand some chance of improving under the new Bishop. For that we hope and pray. As for Catholics “not turning on each other” – our duty is to defend our Faith and whether the attacks on the Faith come from within the Church or outside, our first duty is to the Faith, not to worry about a false loyalty to fellow Catholics, born out of a fear of offending their sensibilities, or to a false obedience to clergy and hierarchy. Oops! If praise is a sign of generosity of soul, then think of me as the scrooge of the CT blog for failing to do my duty by webmaster. I had intended to praise the new-look website, a great improvement indeed, but got distracted and forgot. So, a belated congratulations on the improved site and a step down the pay scale for old misery guts me! I couldn’t say it was a “great improvement”, just another great site. The CT websites are always to an extremely high standard. OK, so I’m trying to get UP the pay scale – LOL! I’d had a new haircut/style and my “friend” made no comment either on the journey into school or on our return home, nor did she make any remark during the day. Actually, truth be told, and webmaster will bear this out, it took me quite a while to get used to the new site, and I’m still not quite used to it yet. I really loved the bright red of the old site and preferred the layout, although the new one is growing on me. I had only wanted to cut down some pages, and pep up the one we had, but when webmaster gets it into his head that we ought to “upgrade” (as he puts it) “upgrade” we must do! The BBC report about Fr Nolan’s appointment mentions that he is VG of Motherwell Diocese. In the light of what you say # 1.05pm, t is interesting that the Pope chose a VG from another Diocese over Fr McFadden when he is VG of Galloway and a former seminary rector. I, too, love the new look website nearly as much as its predecessor! Pay rise? As for the new bishop, he’s a dark horse and I think we’ll need to wait and see if he goes along with the Embracing Change project or quietly puts it to bed. That would take courage, so it will be interesting to see what he does. I agree we should all pray for him as he prepares to take up his post. Well, we’ll just have to wait and see. It would be marvellous if he had the mettle of a Archbishop Burke, maybe he has. If you mean Cardinal Burke who was sacked by the Pope during the Synod, I’d be surprised if any priest in Scotland had that sort of mettle. As you say, we’ll have to wait and see. … but not his dress sense, surely, Helena! I had a telephone call today from one of the supporters of Fr Despard, a gentleman who has attended the court hearings, and he thought that we ought to be aware of the fact that Fr Nolan has not treated Fr Despard at all well. Fr Nolan is the administrator of Fr Despard’s parish, in his absence. Under oath, in court, Fr Despard said that Fr Nolan had put himself forward to administrate St John Ogilvie’s parish (during Fr Despard’s suspension) “to gain revenge” for the naming of his Blairs College friends in Fr Despard’s book, Crisis in the Priesthood. Some of Fr Despard’s supporters also attended a packed meeting last night, presided over by Bishop Toal who took questions, a number of which were about the Fr Despard case. When it was pointed out to the Bishop that Fr Nolan had forbidden prayers for Fr Nolan [correction; prayers for Fr Despard] in the church, claiming it was on the orders of Bishop Toal, the Bishop denied having given any such order. So, we must continue to pray for the Fr Despard situation as well as for much grace for Fr Nolan – there is clearly something rotten in the State of Motherwell. The last thing we need, is more decline in Galloway, already, manifestly, terminally ill. We’re now looking for a miracle cure, so let’s pray for much grace for Fr Nolan, that he may help bring a resolution to Fr Despard’s situation before he heads south to Galloway. A chop off the old block indeed, a typical +Maurice Taylor approach to those not within the coterie! this socalled Catholic blog is the biggest joke ive seen yet. All i can say is that as a traditional catholic myself i understand that it is of the utmost importance to study logic and philosophy before moving onto study the sacred science and therefor qualifying myself to discuss church matters. So here is an idea get your comments out of your heart and discuss with your heads because until then i can tell you right now that your little “newsletter” will go to the recycling bin as soon as it arrives in any intelligent persons desk. And to the Editor who seems to all intensive purposes to afraid to let people know its (her) name i fully support Ninians comments and as a person who has lived in the diocese of Galloway for 30+ years i am aware of the problems that it faces but having also studied in other diocese’ i am aware that there are similar problems there! Only way i can see you fixing your issues is taking your select few priests that you like and setting up your Catholic Truth church and leave us alone! We do not need this in our lives. And in reply to defending the faith – how about you leave that to the professionals who i am sure know way more about it than you considering they have given up their lives so that they might know God better and serve him more fully. It speaks for itself that you argue that only “professionals” may or should defend the Faith, when it is a basic duty of our Baptism and Confirmation to do so. At Confirmation, we are anointed precisely for the purpose of being Soldiers of Christ and defending our Faith when it is under attack – whether from within or outside the Church. So, your study of logic and philosophy not to mention your claim to be a “traditional” Catholic, hasn’t really helped you to know and understand what it means to be a Catholic – at any time in history, let alone in the special circumstances of the worst ever crisis to afflict Holy Mother Church. Your anger is such that I can only assume that you are happy with “Embracing Change” in your diocese, and with the fact that your Vicar General, Fr McFadden, is a known and unashamed dissenter, and – it almost goes with out saying – that you have no problems with the scandalous statements from Pope Francis day in and day out. He’s the Pope, so the Holy Spirit picked him, right? Everything he says comes from God, right? You are hitting out in anger at Catholic Truth, without giving a single example of where we contradict the teaching of the Church, because, of course, you can’t – we don’t. That has been the modus operandi of all of our critics from the day of our launch, Feast of St John Ogilvie, in 1999. So, we’re used to that form of attack, and it doesn’t bother us one jot. We WOULD be worried, of course, if you could find a single example of error in our newsletter, website or blog, so there’s a challenge for you – off you go! What you are peddling is Rationalism, not Religion. No wonder Galloway is in the mess it is! You speak of being learned in Philosophy and logic, yet your comments fail the test of basic written English. I don’t think you’ll fool anyone, Joseph. “Traditional Catholic”? Are you having a laugh? I`m ashamed to admit, after reading your posts, that I am from the Galloway Diocese also. I am not surprised though, considering the state that the diocese is in, that you are from there. It is people like you who have contributed, and are still contributing, to its meltdown. But then, who am I to judge? And since you are so keen in correcting other people`s honest mistakes, I will ask you; should it not be to all INTENTS and purposes? If you wish my full name I will be willing to oblige. I’ll even give my full address. What about you? Think of the devil! I was just wondering where you’d gone. Welcome back! also its such a shame that Fr Nolan denied prayers for….em Fr Nolan? just shows the worth of this blog – doesnt even check its own mistakes while commenting on others! Thank you for that – due to major pressures, including serious family illness, I’m afraid my visits to the blog are very rushed and I’m typing at high speed, without careful checks, at the present time. So, my apologies for that careless typo. Thank you for pointing it out – I’ve now corrected it in the text. Thank you. Joseph, if you would like to impress us with your considerable knowledge of church matters and the best way to defend the Faith, why did you not do so by posting an intelligent and intelligible reply? You might have helped us, instead you have chosen to pick on typos of all things!